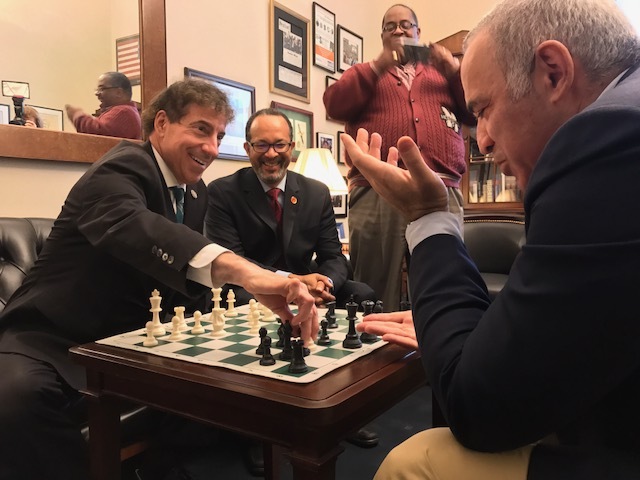 Maryland Democratic Rep. Jamie Raskin, 55, talks about the heart of the legislative process, what his colleagues call him, and how he angered a world chess champion. Q: What about Congress didn’t you expect? A: I was a state senator in Annapolis for a decade, and I was shocked when I got here to observe that we would vote on bills without having hearings on them. In Maryland, every bill must have a hearing, and no bill can be voted on without a hearing. To me, the hearing is the heart of the legislative process. This is where we gather the data about what’s going on and assemble our conclusions about what needs to be done. So it seems to me we’ve been skipping a huge part of the legislative process by not conducting hearings. Q: As a local, what weekend activities would you recommend? A: They’ve got to go hiking with me in Rock Creek Park or the C&O Canal. Or come on out to Frederick County, and we can take them to some Civil War battlefields. Q: What kind of unique perspective does your law background give you? A: I’ve been a constitutional law professor for 20 years, and I have thousands of former students, including one of my colleagues, Stacey Plaskett. She’ll tell you that I pushed her to go become a prosecutor. The other day in committee, Trey Gowdy was chairing a hearing and he called me “Professor Raskin.” That’s always a thrill and the highest honor for me when my colleagues refer to me as “professor,” because I don’t think I’ve ever lost, I certainly haven’t wanted to lose, an academic approach to the problems that we confront. It really shouldn’t all be about partisan combat. Q: Tell me about when you played chess with a world champion. Q: Are you a pianist like your father? A: My father was a concert pianist. My father was a very serious pianist, and so we all learned at his feet. I’m primarily interested in blues and jazz piano now, and I don’t play classical. I’ve been playing my whole life. I can read music only in the most primitive and kindergarten way. We learned by watching and listening in our house. Last book read: “This Is an Uprising” by Mark Engler and Paul Engler. Pet peeve: People using “impact” as a verb. That’s pretty much a job qualification in my office that you agree to not use “impact” as a verb ever. That’s a firing offense around here. Cats or dogs: I love dogs. We have Toby and Potter. I actually do love cats — and I’m not just pandering to the cat vote — but I am allergic to cats. If you could have dinner with one person, living or dead: The honest emotional answer is I would have dinner now with my dad and my mom, both of whom I lost. A less personal answer … I’d like to have, in the members’ dining room, a lunch with Tom Paine and Frederick Douglass. Closest friend across the aisle: Lamar Smith … he’s an absolute riot. His views on climate change aren’t that funny, but he’s got a lot of intelligence and a really good heart.